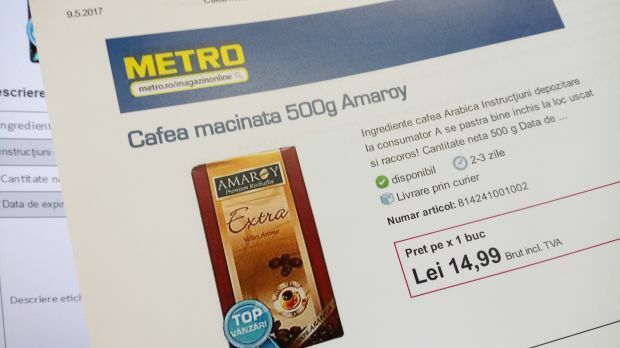 Thanks to an importer, Aldi Süd sells its Amaroy private label coffee in Romanian retail and wholesale stores without having own operations in the country. Aldi Süd is merging its coffee roasteries into a common association to better exploit potential distribution gains. The German discounter’s coffee factories in Mülheim an der Ruhr and in Ketsch near Heidelberg are being consolidated into one society named NewCoffee Roasting Specialists, the retailer said in a statement. Following its creation, NewCoffee will trade as an independent subsidiary of the Aldi Süd Group, headquartered in Ketsch. Michael Körnig and Jens Daniel have been appointed as managing directors. Aldi Süd’s coffee is mainly sold in the discounter’s international stores, predominantly under its own brands Amaroy and Tizio. In addition, Aldi Süd supplies other international companies with its coffee, although customers have not been named. The aim of the reorganisation is to “better exploit external distribution potential”, the retailer said. The disincorporation of Aldi Süd’s two coffee roasting facilities – with the aim of activating and exhausting marketing and distribution opportunities – is long overdue; and it is an indication of what we can expect to come. Own production facilities for retailers may make sense for various reasons, but they create dependencies in terms of plant utilisation, as we can see here. In the case of own brand coffee, there are various reasons why Aldi Süd is understood to have acted in this way. First, roasted ground coffee is a very German thing. But even there, not only pads and pods (which Aldi still produces itself), but also capsules, are taking over the reign. Aldi Süd has its own capsule system Expressi, based on the K-Fee system from Kroger (just like Starbucks’), but does not produce these capsules. So, overall demand is stagnating or declining. Moreover, with the store network expansion in Germany coming to a halt, the total demand is declining as Aldi's overseas growth markets like the USA and UK cannot compensate for the loss. Annual accounts show that in 2015, the volume of processed coffee sold declined 9.2% in the Ketsch roastery, following a drop of 5.5% in the previous year. External customers of the Ketsch facility include a bakery chain and a Romanian importer – you can buy Amaroy coffees from Metro or Carrefour stores in Romania, for example. However, the biggest hit for coffee volumes is still to come – and Aldi’s reorganisation can be seen as the preparation for it – Aldi's presumed listing of coffee brands. In Germany, ground coffee is still an extremely brand driven business; and at the same time, it is highly promoted as well. Every retailer has one type of coffee on offer each week; and often this makes them even cheaper than the private label alternatives. Aldi, in its effort to become a one-stop shopping destination and attract more shoppers, will need to add branded coffee to its range. But this will result in a massive decline of its own-production coffee. Consequently, to compensate for this expected volume loss, NewCoffee will first have to find new coffee customers around the world.